Jaftex Blog Hop – my turn! Hi everyone! 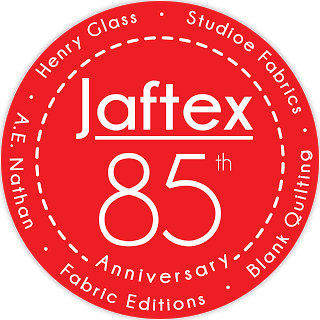 It’s my turn on the Jaftex Blog Hop, where we are celebrating their 85th year of being in the textile business. If you’re new to my blog, welcome! 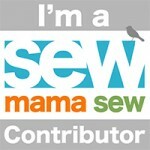 I’m a quilt instructor, blogger and “tips & tricks specialist” for The Quilt Show. Being a wife, mother, and recently a grandmother, balances everything out! I hope you’ll check out my tutorials tab for lots of free quilt patterns and ideas. I was flattered and excited when Linda Lum DeBono contacted me on behalf of Jaftex, which is a family business representing three fabrics companies based in New York; Henry Glass, Blank Quilting Corp., and Studioe Fabrics. They were looking for 30 bloggers, designers and companies to participate in their blog hop that has now resulted in 30 projects being shared throughout September and chances to win fantastic prizes for you guys! Thank you, Linda, for all of your hard work putting this blog hop together. Let me show you my project first, and then we’ll get to the prizes, next. 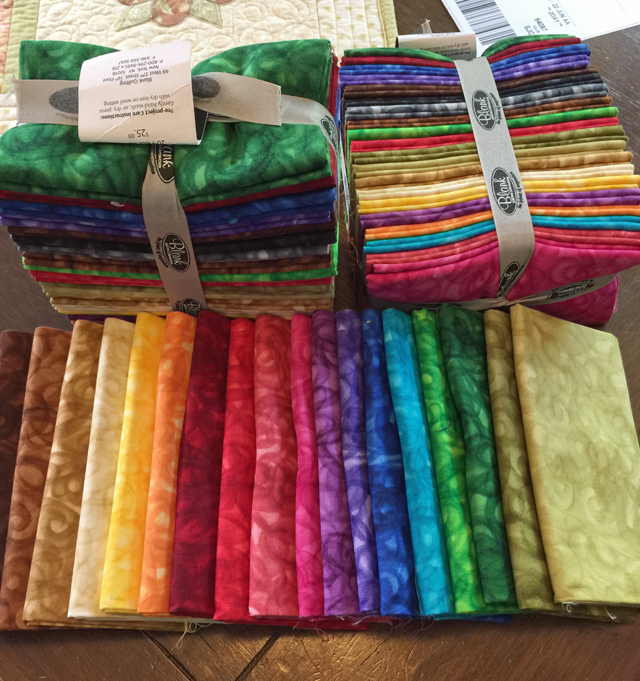 I was sent a fat quarter bundle of Fusion Illusion from Blank Quilting. (Yes, you’ll notice there are three bundles – one is for me to keep and the other two are for two lucky readers! See end of this post for details). I truly had no idea what I was going to make out of this fabric, so the bundle sat in my sewing room and percolated for a while (like a good cup of coffee would). I was leaning towards a rainbow type of design because of the beautiful, saturated colors in this bundle. I’ve been wanting to make a hot air balloon block for a while and I thought it might work for this occasion. So, I started with one balloon and soon it became a fleet of hot air balloons. I decided it needed some flying geese in the sky to make things interesting. Thus, the name of my quilt is “Watch Out for those Geese!”. It measures 45″ x 60″. The plan was to have this project longarm quilted, but both of the ladies I had in mind were unavailable (sick and on vacation). I only had 4 days to quilt this myself – gasp! A minor panic attack ensued. I love to free motion quilt, but it had been a while since I’d done anything larger than a wall hanging. Well, let me tell ya, there was a lot of sweating involved and it wasn’t just because of hot flashes. A lovely heat wave, no air-conditioning, the looming deadline AND hot flashes all contributed! 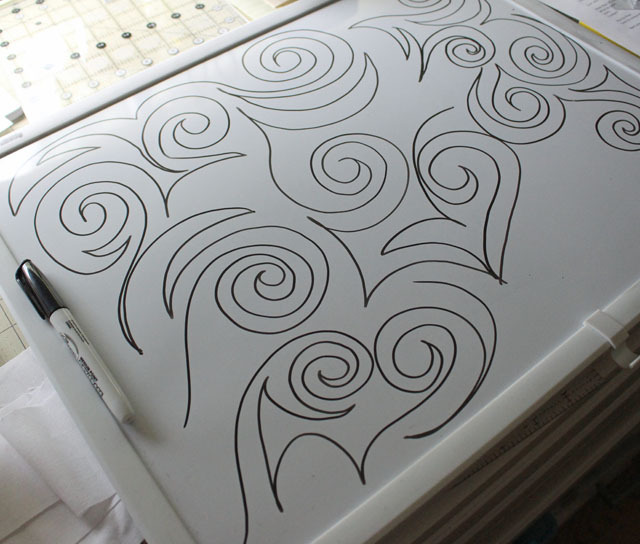 To start, I used my trusty dry erase board to practice some designs and then got to work. Check out my Free Motion Practice Tips for more ideas. My favorite is this rainbow and black striped balloon. This was my favorite one to quilt! I changed thread with each band of color and I love how it shows up in the black rectangles. I used Magnifico thread by Superior Threads for most of the quilting. It has a beautiful sheen to it and it’s really easy to use. It’s easy to make a hot air balloon out of just about any kind of design. Here’s a traditional Ohio star block turned into a hot air balloon with the addition of corner triangles and a basket. A bargello balloon in warm colors was easy to make. I love how the colors play together. Simple stripes is common in traditional hot air balloons. I had to make one of those. And this one reminds me of a super hero. I think it’s the color combination. Notice that the balloons aren’t all the same size or shape. This one is a little longer. And since this is for an anniversary, I had to make a personalized balloon just for Jaftex. Oh, the possibilities are endless! I even had fun making the quilt label for the back. Saving those fabric selvages came in real handy for this one! How would you like to make your own hot air balloon block? I thought so! I’m working on a tutorial for a mini hot air balloon quilt for my readers. Make sure to follow me, so you don’t miss out! The links for email subscription or RSS feed are in the upper right sidebar. You can always find me on Instagram and Pinterest, too! You can still enter the big giveaway from Jaftex, which is graciously sponsored by Janome, Aurifil Threads, and Schmetz Needles. 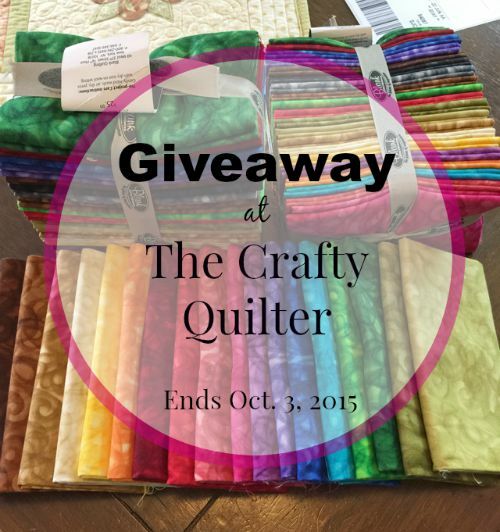 You can even win fabric for your favorite quilt shop! Check out the widget below for details. Here’s the rest of the blog hop schedule. Make sure to visit Mary Ellen at Little Quilts tomorrow! September 29 – Jenny @ Martingale&amp; Co. Thank you for stopping by The Crafty Quilter today and Happy Anniversary, Jaftex! HI Julie…I receive your newsletter and follow you on Pinterest, and am panting at the bit for the tute on the hot air balloon quilt. Absolutely fantastic, and I’ve got 6 great granddaughters that would love to receive something made with that pattern. Thanks for the giveaway opportunity. I follow you on Pinterest and by bookmarking your blog. I follow you on Pinterest. 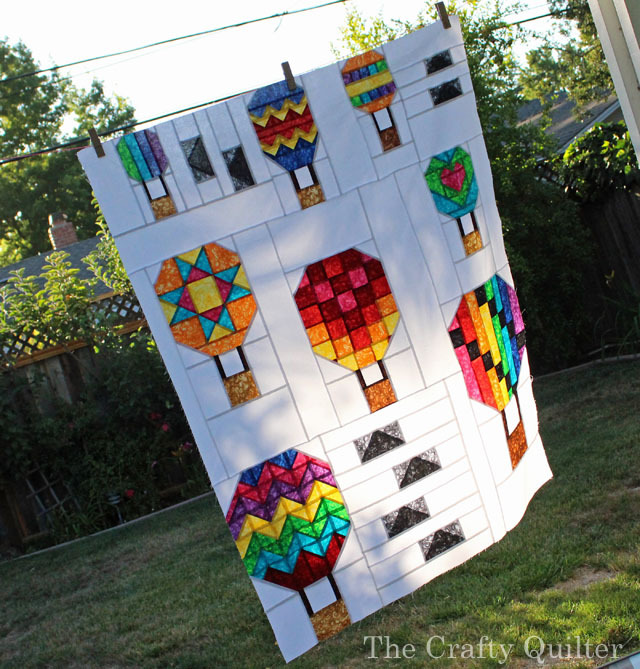 Very adorable hot air balloon quilt pattern. I am following you on Blogloving as Rose Santuci-Sofranko. Thanks and God bless! I came back to your Jaftex blog post for another visit. So much fun and possibility with the set. I follow through Pinterest. Great quilt. Love your hot air balloon quilt! New bloglovin follower! This quilt is so cool!!! I love the creativity you used in creating you balloons and in your FMQ. You have such a great talent! If I were to design my own balloon I would probably include a butterfly or do some improv to create it. Happy Burthday Jaftex!! I just love those balloons! Beautiful quilting for a beautiful quilt. Looking forward to your tutorial. I’m a new follower on bloglovin. I just found you and I’m now following you via email. LOVE those balloons!!! I am a new email subscriber. I absolutely LOVE what you have done with these fabrics. I am an instagram follower! Love your balloon quilt by the way! Your quilt is truly creative and inspirational! A beautiful use of those beautiful fabrics and your machine quilting is fantastic! I follow you on Bloglovin’ and I watch your tips & tricks videos on The Quilt Show. I love everything you do!! Your quilt is very fun! Thanks for the give away. I’d like SewCrazy in Austin Tx to win. Small shop with great unique inventory and owner. Those balloons are fantastic. Looking forward to your tutorial. You did a find job on the quilting. I follow by email. Hot air balloons are so neat! Very fun! I have just signed up for your emails! I adore batiks and have a few in my stash although not the rainbow colours which look much more fun now that I have 3 granddaughters! For me winter and early spring are for sewing so I am getting my projects in order! I just signed up to receive e-mails from you. This is my first time on your blog. I love the hot-air balloon quilt you designed and made! The bright colors are really fun! I follow you Julie on your blog and your great videos on the Quilting Show. Last year I made Janet Stone’s quilt and followed your videos. I love the quilt. I remember reading on your blog that someone asked you to describe yourself and I can’t believe your answers. We are definitely soul sisters. I read your answers and kept saying ” yup, that’s me to a T “. Love your quilting and learning from you. Great website! What a fun and happy quilt! Makes you automatically smile. Would love to make one for a grandchild but all I have are granddogs. :( Guess I would just have to make one for me! I’m a new follower on e-mail. What a great quilt! I love it! I started following your blog almost a year ago when a friend sent me an e-mail sharing your work. From that time on I’ve looked forward to your Sunday inspiration. Your clear directions, pictures and ideas have made me want to quilt once again. Thank you and congratulations On being chosen to be part of the Jaftex 85th Anniversary. Your work showcases their beautiful fabric perfectly. Julie, I follow you on bloglovin’ and never miss you on the Quilt Show. What a darling quilt. Your quilting is fantastic, and in 4 days, wow! Thank you for your very informative lessons and patterns. You have a natural gift for teaching. Congratulations G’ma, Isn’t it so much fun. I follow you by email (and by seeing your videos on the The Quilt Show blog). All of your hot air balloons are so cute and clever. I especially liked your use of selvedges to make the label balloon! Wow! I just hopped by to check out what you did with your bundle of Fusion Illusion. I am really impressed! What a beautiful quilt! Great job quilting it in just 4 days! Oh, and I follow through Bloglovin! I really love this little quilt and yes, yes, yes I want a tutorial. I’ve been trying to incorporate a hot air balloon into a challenge and really like the way you’ve done it. I was over complicating it!!!! What a super fun quilt and what a great use of the fabric bundle you were given! I love the different hot air balloons. Thanks so much for the giveaway and the chance to win. I’m a new follower on Instagram. I follow you by email and Pinterest. I love the quilt you did for this project! Wow! Just found your blog doing a web search on how to join pieces of quilt batting. Your instructions are very clear and well-illustrated. Thank you! I’m a late learner in quilting and am inspired by your lovely balloon quilt. I’m also just learning about posting a comment on a blog so I hope I’ve done this right. I’m going to follow you by email so I can learn more. I hope I can win some fabric for my favourite quilt shop – Addie’s Creative Fabrics up here in Canada. They inspire me too! Nan M.
I follow you by email! Love your balloon quilt! Thank you for the wonderful chance at this giveaway!! What a darling and bright quilt. I loved your close-ups of the balloons. I now follow with Bloglovin. What a SUPERB quilt – it’s just wonderful – and the quilting is just right for each block. It makes me smile. Thanks for posting your free motion quilting ideas. I need inspiration. Looks like you are using a Juki. Just got a TL2010Q myself and I think it’s a good machine for piecing and quilting. Thanks for all that you share. I follow you via Pinterest. Looks like you had fun free motioning the balloons and the quilt label is very cute. I follow you on Instagram, Pinterest, and Email. I love your balloons. It would be just so much fun to come up with different designs. Love your balloon quilt! I’m an email follower living in the USA! I love your balloon quilt and your quilting is awesome! The fabric is beautiful, too! I follow you on bloglovin. A hot ballon ride is on my bucket list. Maybe this quilt pattern should be too! Love it! 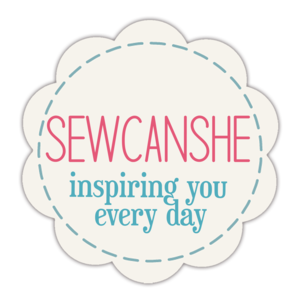 I found you through this blog hop, and I am sew glad I did. Love, love, love the hot air balloons. Can’t wait for your tutorial on a mini quilt. I am signing up to follow you by email. Love the balloons. Such a clever idea. I see myself making these too. Lovely quilt and quilting. 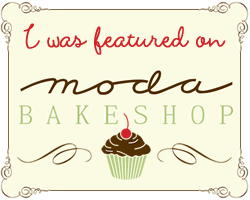 Found you thru this blog hop and want to check out more of your blog. I love following you and seeing all the cool things you do. I follow you through email, Bloglovin’, and Pinterest. I don’t do much on Instagram and I have no idea what Feedly is. LOL!! Thanks for the giveaway!! I follow via IG. Your quilt is great! Oh, Julie!!! You really outdid yourself on this one! Such a clever design and a great way to show off those luscious fabrics. And the quilting? Sooooo good! Love the label too. What a lovely finish! Love the vibrant colors. I follow you on Bloglovin. Thanks for the opportunity. I just signed up for your emails. I love your hot air balloons and your selvage label is fantastic! Julie, I get your emails and was a lucky recipient of yours on a skinny mini exchange (my first one!). I love your emails, hints and especially your Sew Thankful Sunday email! Thank you for your generosity in sharing your talents, knowledge and gifts (in the way of free patterns!). I follow you with my Chrome Slick RSS feed reader. Love these hot air balloon blocks. Looks great with the sunlight showing through the flimsy. Thanks for the opportunity to win this beautiful fabric. I don’t follow you, but you are in my bookmarks (my blog reading is inconsistent, so if I try to follow blogs I often just end up deleting a lot of e-mails). I’m following you on bloglovin…. Oh, I love the beautiful colors. I love your practice tips for free motion quilting. I follow you with pinterest. Thanks so much, and your balloon quilt is absolutely amazing! Your writing style is interesting and it was enjoyable to see how you quilted your quilt. Following you on Pinterest. I love hot air balloons, and your selvedge block is just perfect!!! Following you on IG, @hopefulthreads and Pinterest, Kristy Smith. Thanks! This has been a very inspirational blog hop. your hot air balloon quilt is so bright and cheery. We have a hot air balloon race competition every year in my city and it is a big celebration. This would be a nice quilt for to me think about as a gift for someone in my family. Oops. I follow you via Bloglovin. 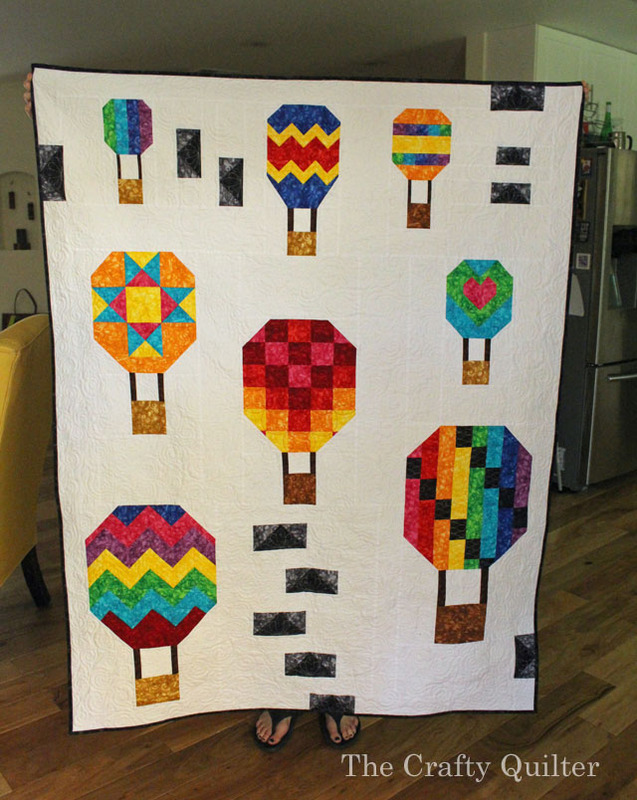 I just adore your balloon quilt! It is so different and colorful. Just as cheerful as they get. I am a new follower on Bloglovin. Such a beautiful quilt and you really nailed it with your free motion. Can’t wait for the tutorial of the hot air balloon. Wow! I love everything about this quilt…and that label! I am looking forward to the mini hot air balloon tutorial and am now following you on bloglovin’. What a happy quilt! I love all the different balloons, so fun! I follow you on Instagram (I’m @muchoxoxo). Love your hot air balloon quilt and look forward to a tutorial. Following you on Bloglovin’. Thank you for the great giveaway! Hi, Julie. I enjoy following you by email. Not only am I lucky enough to have you as a friend and neighbor, but you are also my inspiration for creativity! Love your blog! Hugs! I follow you via bloglovin. 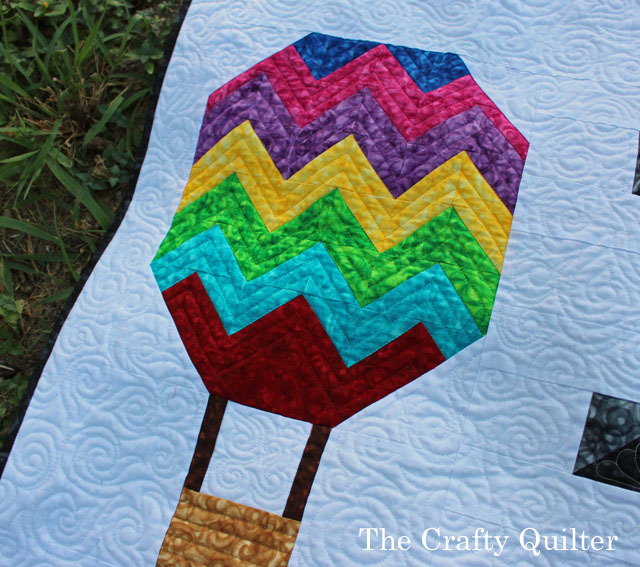 I’ve been seeing strip pieced chevrons for this bundle, but now I’m seeing hot air balloons! Love, love, love this quilt!! And your quilting is to die for! What a wonderful job. 🙂 I follow you via e-mail. I follow on Pinterest. Darling hot air balloon quilt. I really like the quilting on each balloon. It was very eye catching and made each balloon very special with a personality. Thank you for being in this contest. I am a new follower. I really like the quilting designs you put in each balloon. It added so much to each individual one….very eye catching. I am a new follower who is ready for some nice cool fall days. Thank you for being in this contest. I had errors when signing up for your e-mail newsletters. please add me. crystalbluern at onlineok dot com. I already follow on instagram, bloglovin and pinterest. Just signed up to follow you with email. Looking forward to hot air balloon tutorial. How cute is your balloon quilt … fabulous! Love the design and the bright colors. I follow you via Bloglovin. I follow you on email and love your instructions. I have been trying to finsh up on your Spring Petals Table Topper….I am a bit behind….need to try this for a Christmas Table topper!! I found you on Pinterest and then opened your site up in my browser. Love your creativity! I will be following! I love your balloons! Someday I’d like to take a ride in a hot air balloon. I am new subscriber through email; found you because of the Jaftex blog hop. I love your balloons! Such fun, and great colors! I look forward to a pattern/tutorial! I’m a Pinterest, Instagram & Blog follower(you are on the sidebar of my blog). Thanks for the giveaway. Love your quilting! Hi Julie, I follow you via email, love the fabric, a New tutorial is a great idea !! 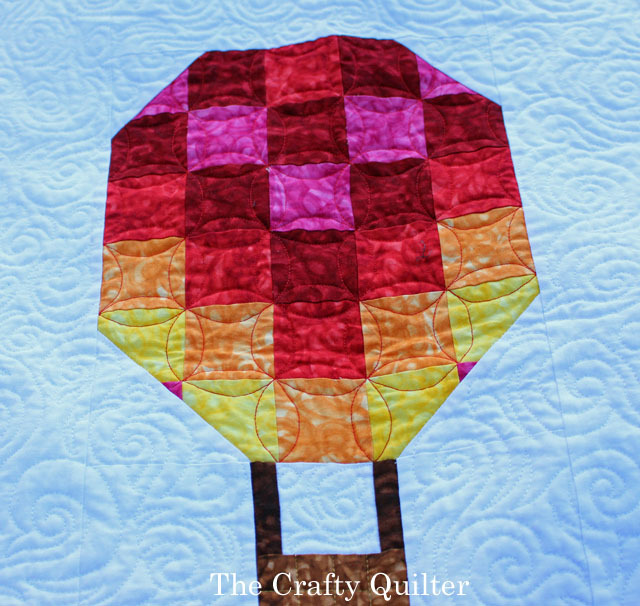 I love the way you utilized the great fabrics in the hot air balloon quilt. The quilt turned out wonderful! Must feel great to have the ability from start to finish with such wonderful results! I get your blog in my email. Signed up for your newsletter. Love the balloons and I appreciate the pictures of the quilting of each. So fun. Thanks. Clever quilt – one that a child would love to cuddle under. I follow you on Bloglovin. Julie – I love the hot air balloon quilt. I get your email newsletter and look forward to them so much. Congratulations on your first grandchild. Grandbabies are the BEST! Hi Julie! Love the hot air balloons. I follow you via e-mail and also love your tips and techniques on The Quilt Show. Thank you and Jaftex for this great opportunity! After breakfast, I check my e-mail for important messages (lots of deleting). I am always delighted to read your quilting newsletter/blog. A nice way to start the day. I sincerely appreciate these brief, well-written, nicely illustrated doses of inspiration and encouragement. Thank you for the smiles. I enjoy your beautiful quilts and tutorials. I follow you on bloglovin and feedly! Your quilt is super! I love it and I follow you on pinterest. Thank you for your tutorials. I’ve learned so much from you. I follow you on Bloglovin and on Pinterest. I follow you with Feedly.. those balloons are just so adorable!! I follow via email. Thanks for the chance to win!! I follow you with bloglovn! I adore the hot air balloons and looking forward to the mini pattern! thanks!! I follow you by email, on Pinterest, and Bloglovin. I love this fun air balloon quilt! Wow, those balloons pop with your quilting. This 85th is a wonderful milestone, and if my Mum was alive now, she would truly marvel at all the quilters, and the fabrics. Your quilt looks like stained glass! Its beautiful! I follow you on email! I follow on BL. The quilt is just plain adorable and the quilting is wonderful! Love your balloon quilt. The coordination of bright colors and quilting motifs is very beautiful. Please enter me in your contest. Thank you. I follow you through e-mail and look forward to everyone of your posts. I am in awe of your quilting on the hot air balloon quilt! Hi your quilt is so cute!!!! I follow you on bloglovin, by email, and Instagram! I read your blog. I have a thing for hot air balloons. They fly over my home. I look forward to receiving all your emails. Great idea with hot air balloons! I follow you by email and blog..GREAT BLOG, Julie..love your Craftsy tutorials, too. I follow with email and look forward to each new post! Thanks for the chance to win! Julie, your balloon quilt is so happy and bright….makes me want to get right in one of the balloons. You don’t need a longarmer. Your free motion quilting is really nice. I follow you by email. What a beautiful quilt! I love the bright cheerful colors. Thanks for the fantastic giveaway. I just added you to Feedly. Your quilting is very inspired and very effective! What a wonderful quilt Julie! What’s even more exciting is your mentioning a tutorial for a mini version….I can’t wait for that. Not only do I follow you via email, but your blog is saved in my FAVOURITES! Thank you so much for a chance at the give-away. I have signed up to follow you through Bloglovin. Thanks for the great giveaway. Loving the quilt….I get your blog by email and really enjoy reading it. Beautiful hot air balloons and such great quilting. I follow you through email. i am a relative newbie to following you on your blog… the old-fashioned way with no instagram, etc. hee hee hee. love the bits and pieces that you share of your family (being a grandma is awesome!!) but, of course, the quilting will keep me coming back for more. you make it seem SOOOO easy. thnx so much for the giveaway!! Love your hot air balloons and will be following your blog to get the pattern for a hot air balloon. Thanks for sharing! I am a new follower on Bloglovin. i’m so glad Jaftex introduced us! Your quilts, including the balloons are lovely! I just do not know how you got my email address but I am glad you did because you have been uvery inspirering to get me to start quilting again after my husband passed away I have not done much quilting. I get your blog by email – one of the few I receive that way – because I don’t want to miss it! You have beautiful creations to share and are a natural teacher. I’m so glad I get to occasionally see you at my favorite quilt store – The Granary! Thanks for sharing your latest wonderful quilt! Hi Julie. Love your balloon quilt! I’m not big on blogs, but I’m always checking my email to see if you’ve sent something. I always read it from start to finish. Your skill and style are evident in everything you make, and it’s always fun to see your latest creations! Keep up the colorful, classy, down-to-earth quilty-crafty eye candy. Love it all! Congratulations on becoming a grandmother. It’s the greatest, right?! Follow by email and always look forward to all you have to share. Hi Julie, I like your choice of quilting on the white background. It reminds me of clouds, but more especially the “updrafts” that ballooners rely on to lift them into the sky. Thanks for your blog – I follow you on my email, and enjoy it very much. Hi, I follow you now on bloglovin. Would love to have a tutorial for your hot air balloon quilt! Thanks for the chance to win! I follow you by email. Your machine quilting is amazing. 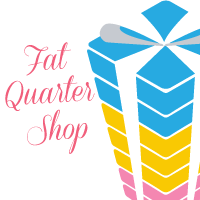 Love the colors in the fat quarter bundles. Would love to make a project with those great colors. I follow you by email. Your quilt is fun and creative. I may have to make some hot air balloons. I’m following you on Bloglovin. love your balloon quilt. i have a new little great-great nephew that this would be great for. you designers keep tempting me!!! Those are beautiful balloons. I love how each one is different. I follow you by email via WordPress. I love you tutorials and the balloon quilt is awesome. I also enjoy your Sunday collections. Your quilt is gorgeous! I follow you via Pinterest, Bloglovin’ & e-mail. Lovely quilt! I’m looking forward to the mini tutorial. Thank you for the generous giveaway and the chance to win. I follow you via Bloglovin and Instagram. Loooove your Hot Air Balloons!!! Gorgeous & so is the quilting! I love your quilt! I just signed up to follow you by e-mail. I am a new follower, by email–I absolutely want to stick around and learn how to construct that mini quilt. I’m going to poke around your website now; I’d like to read about the wedding, grandbaby, and, oh yes, quilts! By the way–were you ever a primary school teacher? Your printing makes me think so. Great quilt label! How fun is that quilt, the fat quarter colors are great for it. I’m an email follower! Hi Julie! You really outdid yourself this time and made Jaftex proud. Love, love this balloon quilt. And a free motion quilting tutorial as well. You are one of the best! Always look forward to reading your blog posts. That is how I keep up with you and your great work. Thanks! Great quilt! I’m following you by email. I love your hot air balloon blocks. You have a good eye for color. Watching the hot air balloons in the late afternoon are one of the few things I miss from our move from San Diego, CA to New Hampshire. I love your blog which I follow by email. One day soon I’m hoping to quilt my Nordic Mini. Thanks for all the great tutorials. Wow, you put a lot of work into this quilt! I especially like that you quilted it on a domestic. My method as well. Great job, beautiful quilt! What a fun quilt! I love all the colours. What a beautiful and cute creation. The colors and the quilting look like jewels! I follow you on Bloglovin & now Instagram. I am a loyal Bloglovin’ follower of yours! What a creative use of these fabrics! I’ll bet it was so much fun to design it and get your ideas onto a quilt. It is beautiful! Great quilt! Love the hot air balloons and the fabrics are just perfect for them. This is my first time visiting your site. What a delightful quilt you have made. The way you used the fabric along with your terrific quilting really brought out the gorgeous fabric. Thanks for showing closeups. This is my first time on your blog. LOve the hot air balloons. Love your quilt – and the selvage label! 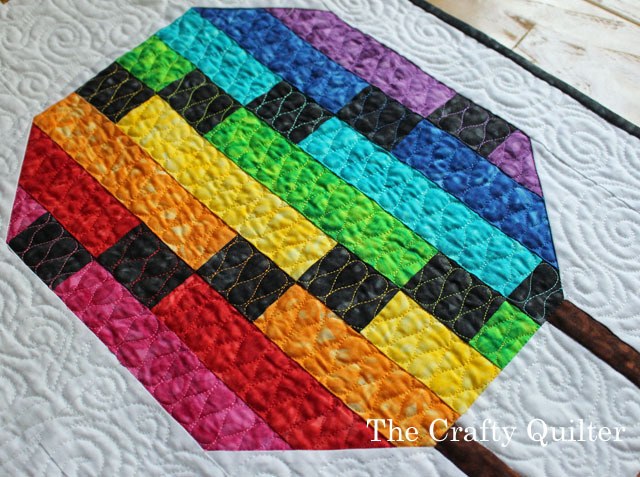 I now follow you on feedly so I won’t miss the tutorial for this quilt! So glad you finished it in time. Thanks for participating and for the chance to win my own rainbow of fabrics! Love your quilt! The fabrics are beautiful and I love how you used different quilting designs on each ballon. I follow you via email and on Instagram and Pinterest. I’ll be watching for your tutorial for this quilt. Thanks for sharing and for the giveaway. What a beautiful quilt Julie. I love the use of colours and the quilting of the balloons. I follow you on blogloving and on Instagram. I have your blog saved permanently on my tablet and that is the first one I open in the morning in case you have posted during my night . I am a longtime email follower of your lovely blog! I especially like your first of the month tutorial roundups! I follow you via Bloglovin Julie, and I love your joyful quilt! It’s the perfect use of these wonderful colors. And I appreciated your humorous observations about the rigors of machine quilting. 🙂 Thanks for sharing this! Hi Julie, I follow your amazing blog via e-mail and your tips and tricks on TheQuiltShow.com! Cute Cute balloons! And good for you to quilt it yourself! Love the use of the really bright colors! Thanks for the giveaway! Well, Julie, I first followed you in person the very first time I made a quilt. You gave me easy to follow instructions at The Granary in Sunnyvale. I still marvel at my first quilt because you were able to make those scary triangles work for us. It was such fun. Now I follow your Crafty Quilter blog on email, check into your website and even check what you are up to on other sites. I recently watched your binding tutorial on The Quilt Show with Alex Anderson and Tried it out with success! What a beautiful quilt. Thank you for the inspiration. I follow you via e-mail. This quilts is PHENOMENAL! Seriously, I can’t get over how awesome it is. I wasn’t following you before, but I am now! Insta, Pinterest and email. What beautiful work!!! Love the bright colors on your hot air balloon quilt! Very nice! What a gorgeous quilt-love the colors and the detailed quilting. I look forward to seeing your tutorial. Thanks for hosting this great giveaway too. I follow you on NewsBlur (a personal news reader). This is the first time I have visited your blog. You made such a cute balloon quilt. I will join the RSS feed. I follow your blog via e-mail. Love your creativity and use of color. Wow, that quilt is amazing! The colors, the variety in the balloon designs, the quilting — all of it over the top fantastic. I follow your blog by email. Great inspirational quilt, Julie, love all the balloons and of course the geese too. I follow by email. I’ve been a follower for over a year now and I do it by email. I love opening my mail program and discovering quilty email. I enjoy receiving your emails – there is always something inspirational in each one. I appreciate your creativity and the information you share. I have also been enjoying watching your videos on TQS. Love your hot air balloons – especially the photo with the sun behind the top – makes all the colors in the quilt look ethereal. I follow you by e-mail. How neat that we both have a Bernina Aurora and a Juki. I just got their sit-down longarm to do FMQ and I love it. Hi! I love your balloons! Thanks for sharing your tips and for the chance to win. I love your quilt but especially the quilting that you did. I hope one day to be able to machine quilt like that. I know practice, practice, practice. I love your quilt – so happy! I follow you on Bloglovin – delliott1000. Thanks! I really enjoy following you on feedly and bloglovin. Thanks for all your great posts! I was introduced to you last year when you gave tips for The Quilt Show Block of the Month and then this year making your quilt. I have followed you through my e-mails (which I signed up for) and enjoy all the tips that you share. I love your hot air balloons. Very pretty quilt and fun too! I follow you on Blogger and very much enjoy your blog. Thanks so much for the chance on the awesome giveaway! Wow, thanks for all those beautiful close up photos of your quilting. I am now a follower by email and look forward to your updates. I love what you did with the fat quarters, your hot air balloon quilt is just awesome. I don’t follow you BUT I do love your hot air balloon quilt. I love your quilt! I have seen you on the Quilt Show emails and now I’m a follower of yours through email. Thanks for the opportunity to win these great fabrics! 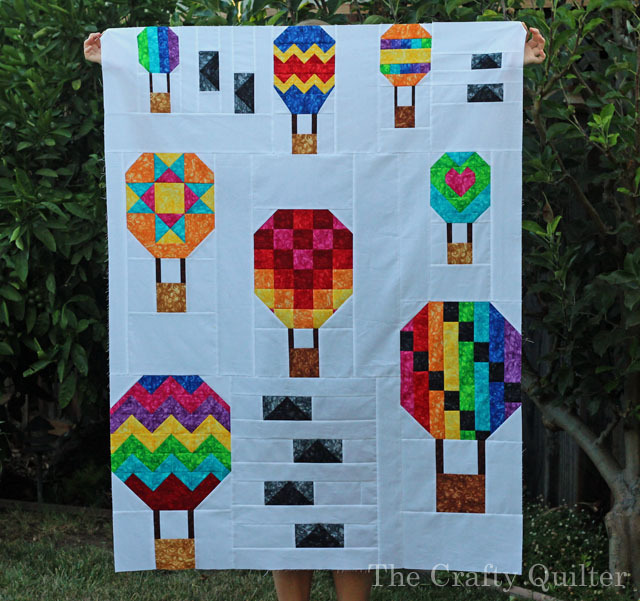 I love the fmq on the balloons and background of your very clever quilt. I follow you via email and love your blog. I’ve been following you for quite a while and I enjoy your patterns and tips. I used your “Cookie Crumb Catcher” pattern for Christmas presents for all my friends. It was so much fun putting them together with fabrics that fit each individual. I love that you are featured on “The Quilt Show”! It’s fun to see you “live” via the videos. I recently moved from Silicon Valley and will miss The Granary, but I’m discovering the many shops in the Pacific Northwest. Please keep up the good work. I enjoy your blog and e-mails and hearing about your family. Oh, yes, we have a Brittany, too! The quilt is beautiful and fun. The colors are so bright, perfect for hot air balloons. I have followed you for a couple of years via email after taking some classes with you. Thank you for sharing your wonderful talents. Great idea for these fabrics. I love the colors, and fun of the balloons. I follow via pinterest and Instagram. I’m marymackmademine. Your quilt is awesome! I love all the different quilting done on the balloons. Looking forward to the mini tutorial. I follow you by e-mail. 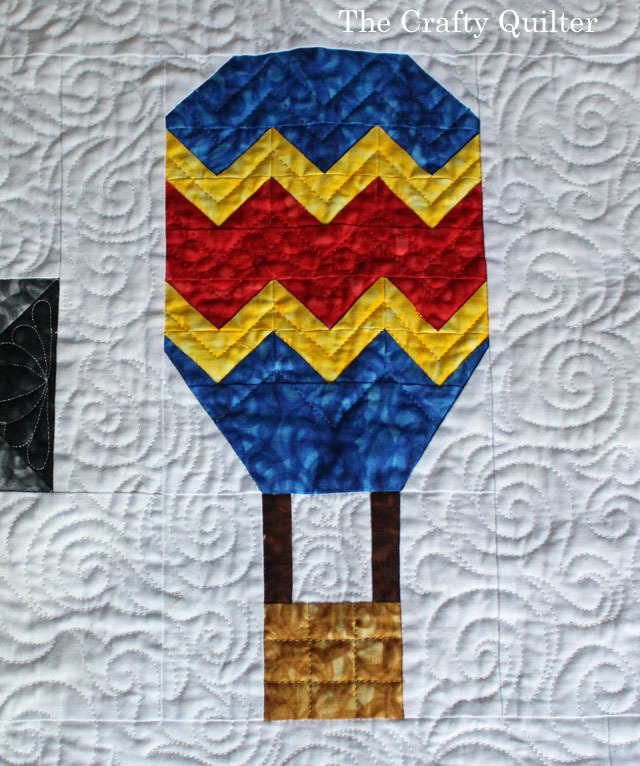 Your quilt is fantastic and I love the different quilting designs in each balloon. I follow you via email. 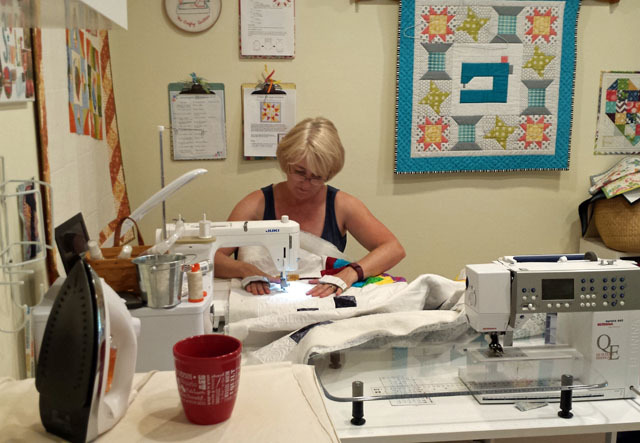 Wow – Julie, your hot air balloon quilt is awesome. I love to watch them when they go up during the balloon fests. I follow you thru email and thank you for the chance to win a great gift!!!!! Love this quilt- the geese made me laugh- perfect addition! I follow on Pinterest. I love your quilt with the hot air balloons. I follow by email and I live in the US. What fun seeing your balloons. I receive your posts via e-mail and have been for several years now. I followed along with your quilt along earlier this year. Those bundles look fabulous, thanks for the chance to win one. The name of your quilt is wonderful. The free motion quilting really adds to your precious quilt. What a fabulous quilt. A hot air balloon quilt has been on my radar for years now. Honest. I’m looking forward to a tutorial. Thanks for the chance to win. I just discovered you and am now following by email. Love it , love it!! I follow by e-mail and I look forward to each and every one. The fabrics are beautiful, Thank you. I don’t follow you, but watch your videos on the Quilt Show. Will be checking out your blog now though. Cute quilt. Great ideas for quilting! Read your blog, love the hot air balloons! Thanks for the chance! follow you on blog login and email. Love your tips and tutorials! I follow with bloglovin. I love your hot air balloon quilt. I like that each balloon is different. I made a paper pieced hot air balloon baby quilt once. I follow you on your blog and get your emails in my inbox and start my day by reading what you are making and creating. Love the hot air balloons…fun! I have both a Cdn and U.S. mail address. Oooh, I love your quilt, especially the label. So clever! I’ve been following you by email and look forward to your posts. Thanks for the tutorials and tips. I just found you via “Trends and Traditions” and her blog hop. I love your hot air balloon quilt ~ your free motion quilting is amazing. Thanks for the chance to win. Love the quilting designs you used on the balloons. I follow you on Bloglovin’ and The QUilt Show. I love the bright colors used for the balloons. I wish I had your quilting skills. I follow you via email. The hot air balloon quilt is beautiful! I absolutely love the hot air balloons. Great quilting! I have been following with email. Another beautiful project. You inspire all of us with your creativity. I follow you by email and on pinterest and instagram. The giveaway fabrics are so bright and cheerful, it would be fun to use them. Julie… You have really out done yourself on this one.. This is so darn cute. Your free motion is beautiful and the flying geese touch is so darn cleaver…. :-)) You are for sure “The Crafty Quilter” I just love the balloons…. I just discovered your blog and have been accessing it daily during the month….will have to sign up for email follow. 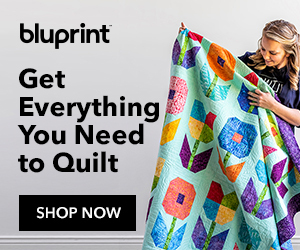 Love your quilt and that you are going to do a free pattern is great. I know I wouldn’t have a problem designing a quilt using those fabrics…the colors are great! Beautiful and great tips as always. I follow you via email and Bloglovin. What a creative idea with that beautiful fabric. Love the balloon designs and your mq is awesome. I follow you on email and Instagram. I follow you by email and on Pinterest. What beautiful fabrics. You created a wondrous quilt to highlight them. Love the quilting. You are always such an inspiration! Hi, Julie–I follow you on Pinterest and by e-mail. Today is my anniversary, too. I love your hot air balloons, and the fabric is perfect for them. Your quilting is… WOW!!! Thank you for the chance to win a bundle of Fusion Illusion! Love your hot air balloon quilt and the quilting is awesome. So vibrant and happy looking! I am from Canada and am an e-mail follower. Keep up the great work! I don’t currently follow you, but I watch your videos on The Quilt Show site. Thanks for this very creative quilt. I follow you by email. 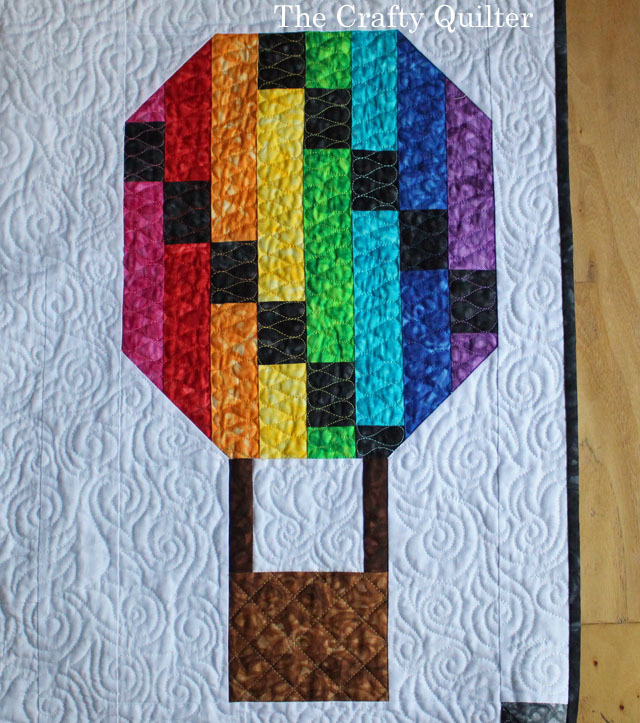 Love your rainbow hotair balloon quilt. The quilting in each balloon is just perfect! I get so much inspiration from you in each post. Looking forward to the pattern. I follow you by email and Bloglovin’. What a cute quilt! What a pretty quilt you came up with, love all those colors. I follow you with bloglovin and by e-mail. I am in Arizona. Thanks for a chance to win. Wow! That is beautiful! I follow you by email and Pinterest. We went to the hot are balloon fiesta in Albuquerque NM. This would make a great memory quilt. Can’t wait for your tutorial!! Good morning! I love following your blog through e-mail. As I’m reading your post, I hear the sound of geese outside my window!!! Their usual morning flight from some pond in the area back to their daily outing at the Sunnyvale Golf Course. Can you believe it? They must have known you were writing about them. I was looking for a hot air balloon up in the sky, but no luck. So funny. I signed up to follow by email! What great fabric and awesome quilt!! While I don’t “follow” blogs, I do have many, including yours bookmarked. I visit your site on a regular basis and enjoy reading your blog. I loved the wedding blog. It’s great to see a nice wedding in a natural setting. Thank you. I follow you with both emails and Pinterest. I think it is just so easy to pick out a tutorial from Pinterest! I love the Balloons, but I really love your quilting. What great quilt designs! I follow you by email. Your quilting looks terrific. I’m amazed at how good your spirals look. The last time I did spirals a lot of them looked like ET heads. Love the colors of these fabrics. The hot-air balloons were a perfect choice. You make them look so easy. Love the hot air balloons – so vibrant. I follow you by email. Great quilt and the machine quilting is a lot of fun. I follow through Bloglovin. This brightly colored would make a cute toddler quilt. Think I’ll give it a try. I’m anxious to see you mini pattern too. I follow you on email and instagram. Beautiful quilting on a beautiful quilt! I have to say that you did a wonderful job quilting your hot air balloons quilt. I love your special stitches for each balloon and your label is perfect. Thank-you for such a nice giveaway, I follow you by email and am excited to see the pattern/tutorial for this lovely quilt. Hot air balloons are breathtaking. I follow you through email and have been for about two years. Your projects are always beautiful and inspiring! Congratulations on your new Grandbaby! Oops, follow on email and Instagram. 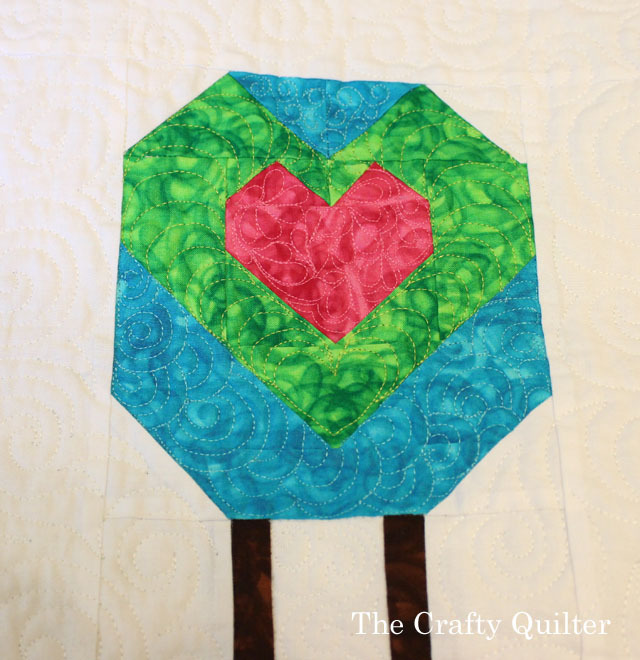 Love your quilt and your quilting is great! I would never attempt that much quilting on a home machine. I follow you on Bloglovin. Your balloons are beautiful and the quilting looks gorgeous! I am a newbie on quilting my own projects. I haven’t ventured beyond baby quilt size on my own! Maybe I’ll be more adventurous if it ever cools off in TX! Hi Julie. I follow you by email. I love your balloon quilt and can’t wait for the mini. Hi Julie, I have been following you on your blog since I took your beginning quilt class this summer. 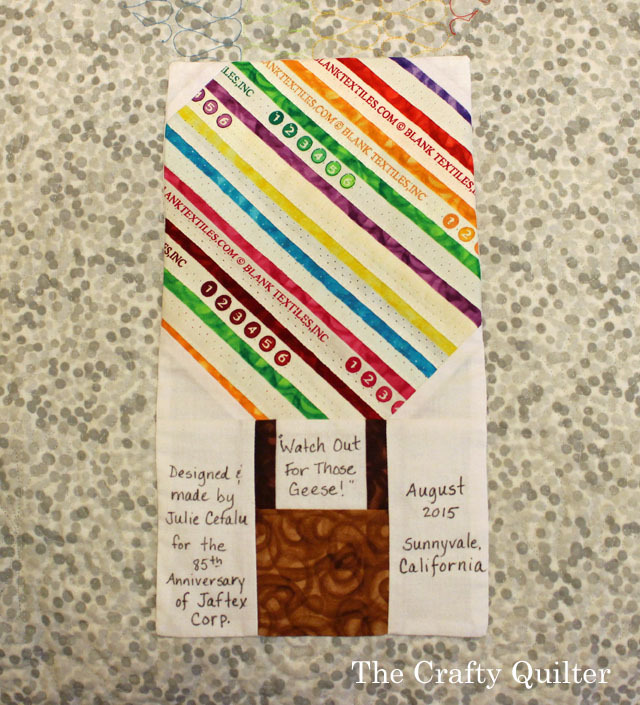 Love the “look out for those geese” hot air balloon quilt. It’s beautiful! Following on Bloglovin’. Nice balloon quilt, like the wind and how each balloon has its own quilting and pattern design. 4 days – great job. Great quilt. The hot air balloons were a good choice for the bright colors. I follow you on e-mail and always learn something from your tutorials. Thank you! I just started following you via email. Love the balloons. Though living in TX now, we used to live in north central PA. Every year, just across the border in Wellsville, NY, they host a hot air balloon rally. I can’t wait for your pattern for this quilt to come out. I would love to make. I follow you on Feedly. 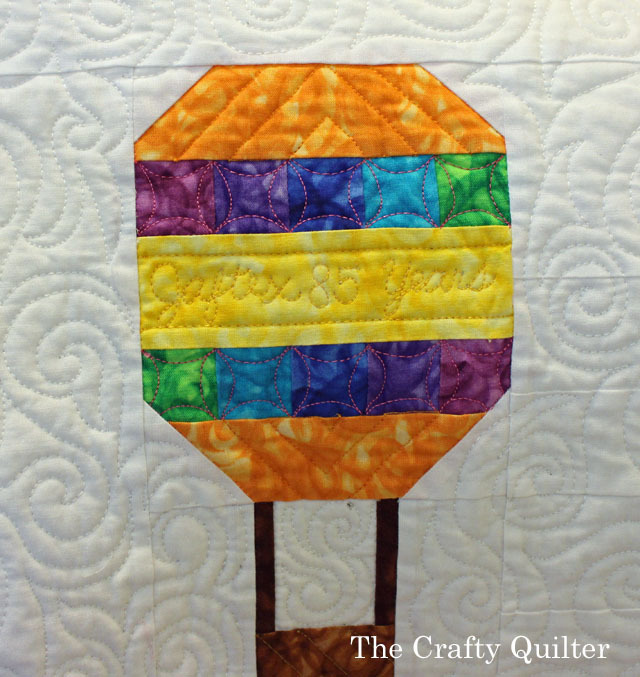 Love the balloon quilt and your quilting is gorgeous! Julie, your balloon quilt is fabulous and the quilting just “takes it over the top”. I follow you by email. 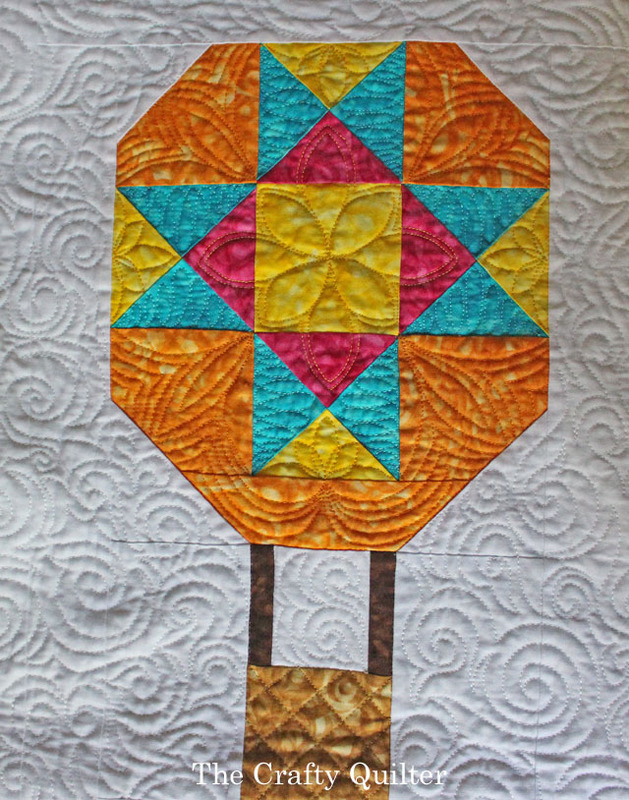 I loved the idea of hot air balloons for your quilt and the free motion quilting adds to each one and the background too. Congrats! I follow you by email. Your quilt and your quilting are outstanding. The colors are perfect for hot air balloons, too, since the ones I’ve seen are always bright and beautiful, like the Fusion Illusion. Hi: Beautiful balloons! I follow u by email!! Thanks for all the nice ideas. I follow you on Bloglovin and by email just to make sure I don’t miss a single post. I love the whimsical feel of your hot air balloon quilt…and of course the fabrics are gorgeous. Your blog is awesome. I follow you by email. This is my 1st visit to your site but I am a follower now (email). I love your site and ideas, thanks! WOW! Not only is your quilt beautiful in the fabrics that you used, but the quilting is sooo awesome! I really love the design of all the balloons. Thank you for sharing and for the giveaway. I am a new follower via Bloglovin. Wow, the quilt looks great! Thanks for the tips on the free motion quilting. I’ve been practicing on my dry erase board too and hope to quilt up a couple of baby quilts this weekend. I follow you through your emails and enjoy them very much! I follow you via email. Lovely quilt, I love the bright colors. Have a great day. Love receiving your e-mails filled with so many pretty fabrics. I follow you via e-mail and love all you tips on free motion quilting. Thanks! Hot Air Balloons are my very favorite, heart pounding, neck breaking events. The rides are spectatular & while looking down one is able to see & hear different sounds, see people looking back while you float along on the brisk, early morning air. This quilt is my favorite of your creations, & I cannot wait for the block to be available! I follow on e-mail. I follow by email. Hot air balloons so neat! Your blog is always filled with great ideas and examples of your creative spirit! I love that you share some of your family life too. I follow you on my email and also watch your segments on the quilt show. The fabrics are so beautifully vibrant–I like their subdued swirling movement. Thanks for all you do. Julie, your quilt & quilting are wonderful! You inspire me to get going learning new quilting designs. I started following you when you gave tips for the A to Z quilt on The Quilt Show. I enjoy your blog so much, both for what you share of your own work and because you are so generous in sharing others. I have found several other blogs through yours. And from one recent Grandma to another, congratulations! I’m a simple e-mail gal! I love hot air balloons in all shapes and sizes! What a great idea! This sparks my fingers and makes them itch to make a quilt incorporating the hot air balloons – will never turn out as delightful as yours but need something this bright and cheery in our new apartment. Thanks so much for your interesting blog posts – I receive them on email. I follow you by email. I love those fabrics I hope I win. I really love the hot air balloon quilt. I can’t wait to see the pattern. The bright colors are wonderful. Beautiful quilt. Your creations always spark my imagination and there are days that I need a spark thrown my way. Love the label. I follow your blog by email. I love hot air balloons and rainbows. You combined both. Eagerly awaiting the pattern. I have been following you via email for a while now. I follow you on bloglovin. Looking forward to the tutorial. My parents had a hot air balloon when I was a kid. Such great adventures! That is a great quilt! I love all the colors and am in awe of the balloons being different sizes and you made it all fit together! I follow you by email and watch your videos on the quilt show. I have to start following you on instagram too! I’ll look forward to the tutorial! 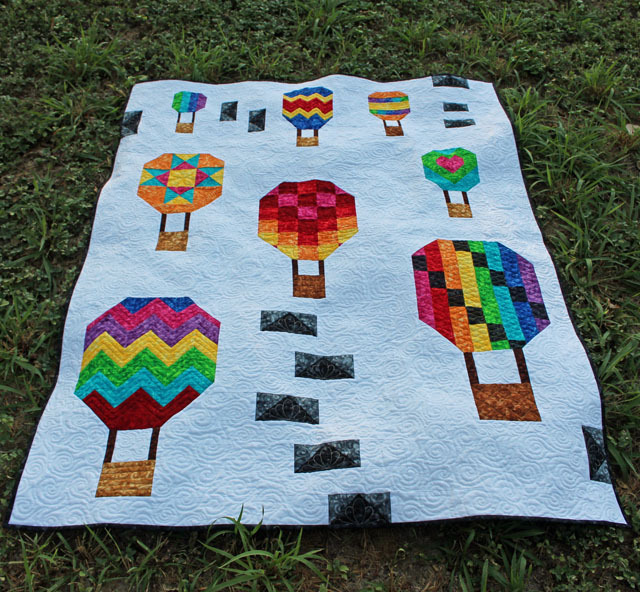 Oh Julie – that hot air balloon quilt is adorable! So excited you are doing a mini pattern for us. I follow you on IG and your blog via email. I would love to win those yummy fabrics. Thanks for the opportunity. Love the hot air balloons and the different designs that you quilted. I love the saturated colors of those fabrics. They would make beautiful quilts! I follow you by email. I LOVE your balloon quilt!!! Great use of the fabrics and I really appreciate how you quilted it!!! Figuring out how to quilt things is very hard for me to do and I am so inspired by reading your blog on this. ( I also love the spools and sewing machine wallhanging in your quilt studio! Is that your pattern?) Thanks for all you share! This is a fun quilt. Great use of the fabrics and the FMQ is terrific. I’m looking forward to your mini hot air balloon tutorial. Thanks for the chance to win one of these bundles. I follow you by email. I follow you on email and look forward to your posts. 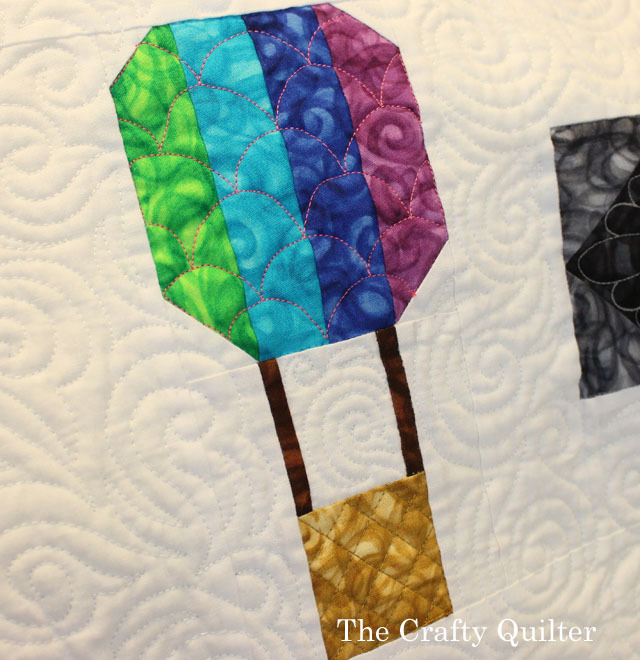 The hot air balloon quilt is great — and I love your free motion quilting motifs! Your machine quilting is fabulous. I follow you on Instagram, watch your tips on TQS and always look forward to your blog. I just found you today because of the blog hop. Great fabric and I love the design! illustrate and inspire me to think about new ideas. An adorable quilt! The quilting in each balloon is fantastic. I am an email subscriber. on it has inspired me. I follow you on Instagram, pinterest and email follower:) I always get excited when I see your email in my inbox. Love the balloons! Adorable quilt! And your machine quilting is flawless! We attended our first hot air balloon show last month-awesome! I follow you via email and Pinterest…and Instagram! Thank you for your continued inspiration. I love this quilt. We lived in Bullhead City, AZ for 5 years and enjoyed the annual hot air balloon festival held across the Colorado River in Laughlin, NV. Someday we’ll make Albuquerque! Great job! This is a really cute quilt and great use of colors! I love your different quilting designs throughout the quilt. I follow you through e-mail. Thank you for the opportunity to win! Happy Anniversary Jaftex! I love your hot air ballon quilt! 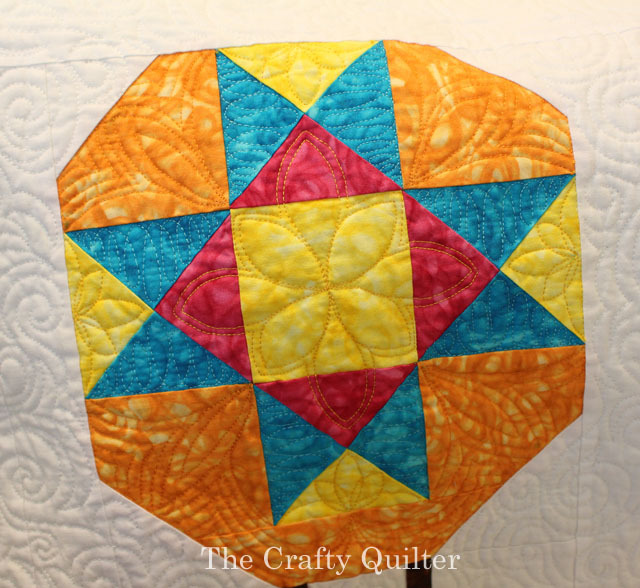 The colors are fun and bright, and the quilting really makes them pop! I follow you through your email newsletter. Julie, as usual, you come up with a great plan for using various fabrics. The balloons are wonderful because of the colors used and the quilting. Following you via e-mail is so very interesting! Love your hot air balloons and the exquisite quilting. I’m an e-mail follower. I really enjoy all the inspiration. Thanks for sharing!!! What a cool idea!!! Love it!!! This would be such a sweet baby or toddler quilt! I follow via Bloglovin and Instagram. You always give me great ideas. Thank you. I follow via email. Fun quilt – thanks for sharing. I’m a follower via Bloglovin’. And happy anniversary to Jaftex. What a cute quilt. Love how the colors pop up in the ballons! I am following via bloglovin’. I LOVE COLOR… and this fabric is fabulous and has so creative options! I enjoy your blog & this balloon quilt is so exciting. Thank you for sharing. So unexpected and so great. This would be a great set for a sampler quilt or a beginner’s quilt class. Your quilting is envious. This is me first blog hop that I have actively followed live, learning so much each day. Looking forward to visiting you again. Julie, I follow on bloglovin and email. I love all the different types of quilting designs you included in your lovely quilt. Hi Julie, I’ve been following you for some time by email. I love your balloons and I pinned your post to reference your wonderful quilting! Thanks for sharing and happy anniversary to Jaftex! I’ve been following you for awhile now – mainly because you have such wonderfully creative ideas! I love your design for Jaftex and I’m really looking forward to your tutorial for the hot air balloon block! Thanks! 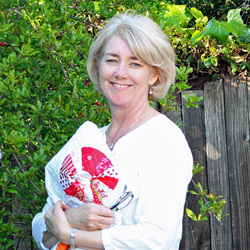 I am so happy I found you Julie…your style,color choices and quilting inspire me daily! Congratulations to Jaftex, you made them proud! I am an e-mail reader. Julie, not only are the colors fabulous but I love the way you quilted each balloon differently and the background quilting looks like clouds floating by. I follow you by email in the US and summers in Canada. I love to read your blog for quilting inspiration and fun ideas. I love the hot air balloonshow and the beautiful colors of the fabrics. I am a email follower in the USA. I love your hot air balloon quilt; so fresh and bold colors! The FMQ makes it perfect! Great quilt Julie! Thank you and Jaftex for this chance to win these beautiful fabrics….I’m an email reader from the USA. I think these fabrics are so versatile, as you have proven with those great hot air balloons. I have some of the blue and just love it! I am a happy e-mail follower (with a US mailing address). I just love what you designed for this group of fabrics. I do love all the fusion colors, so I am glad they are continuing to put out new colors. Love your blog and your imagination—cooler weather ahead I hope, am ready for rain already!